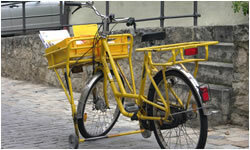 We deliver every kind of letter or parcel, up to each size which a person can carry, to your recipient. Without detours, without stopover just directly. Faster is not possible. TMW offers this service for routes up to 1000 km. So freights to e.g. Hamburg, Rotterdam or Trieste are no problem.